Elementary Matters: I Won Big in Vegas! Yes, that says 24 cents. 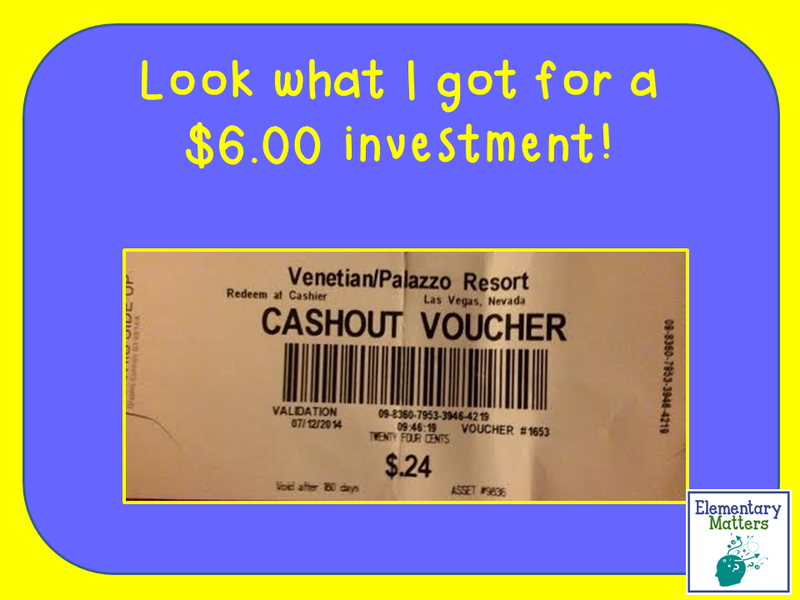 I could have cashed it in, but I thought the voucher was a much more entertaining souvenir! So the gold I came back with wasn't cash, it was far more valuable. It was knowledge! 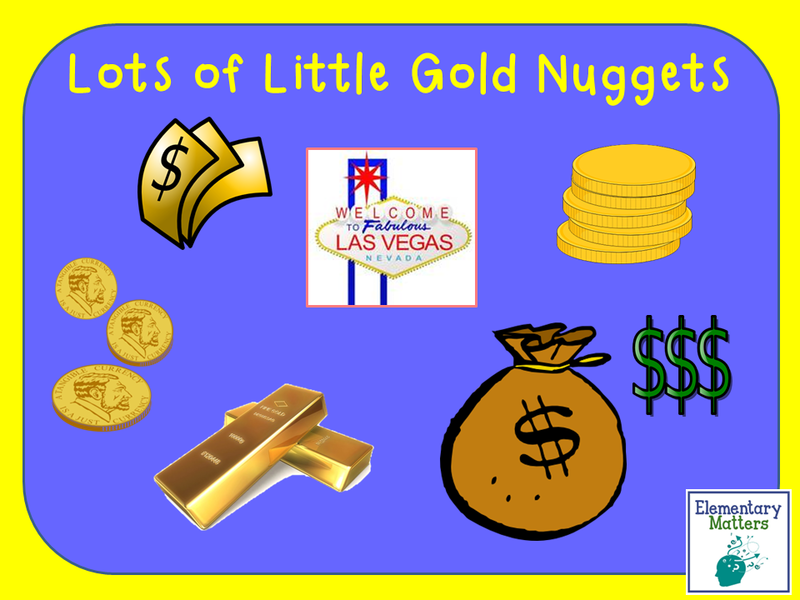 Honestly, many of these things I knew, but this was reinforced by my 4 days in Vegas with teachers! 1. 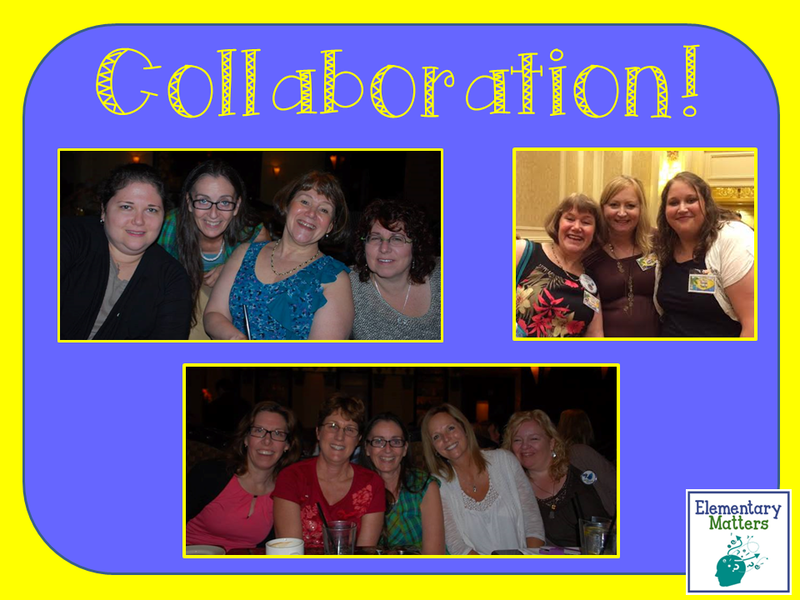 Collaboration! There is strength in numbers. When teachers (or anyone) share ideas and work together, supporting each others efforts, everyone wins! This concept was truly evident this week. I saw many cases of teachers giving "shout outs" suggestions, advice, and encouragement to other teachers, and it warms my heart. I've never been much of a competitive person. I'd much prefer that we all get along and work together, which I've always found to work best! On the left is Deanna Jump, the #1 seller of Teachers Pay Teachers. I'm lucky to have met Deanna at last year's get together, and was sitting right up front for her part of the Keynote address. She told her story, and it was clear to all that she is a good person! She's humble, genuine, and down to earth. I met many people over the last few days that met that description! 3. 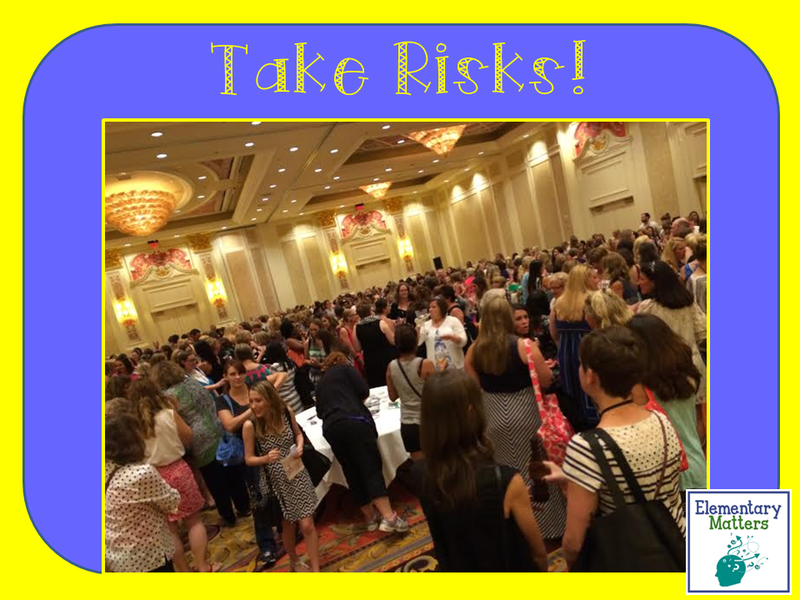 Take Risks! Yep, I always knew that taking risks is important, but I was way out of my comfort zone for a lot of this week. I'm basically an introvert, and I'm often shy, especially around people I don't know well. Wednesday night was the blogger meet up. There were several hundred teachers, all talking at once, most of whom I'd never met. My natural instinct is to run away when it comes to large groups, but I bit the bullet and started chatting and circulating! I'm so glad I did! I talked to people that I've "known" for years online through blogs and facebook, but I finally met them face to face! There were others I wasn't familiar with, and I'm glad that has changed! I forced myself to go right up to strangers, introduce myself, ask them about themselves, and pushed myself to keep circulating. I'm so glad I did! 4. Have something Memorable! Despite Rachel Lynette's suggestion to keep profile pictures "professional", I'm glad I have used the picture I have, which is far from professional looking! 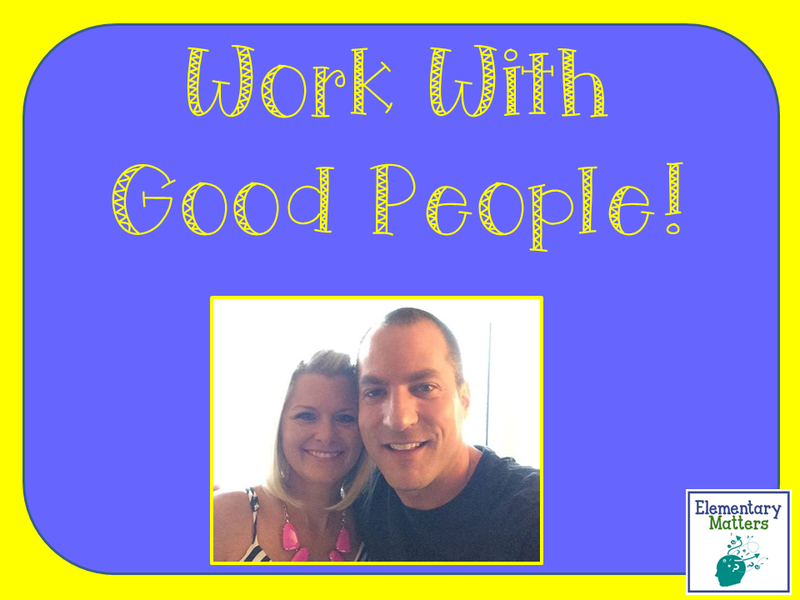 (Rachel DID give her disclaimer: "If something is working for you, keep doing it!) I've used my silly pose as my profile picture for a while, and more people recognized my picture than remembered my name or my logo. That taught me I needed to keep using this picture, because I want to be remembered! I suspected this was the case, so I made nametags with that picture on it, and wore them most of the time in Vegas! I have to admit, that silly picture represents me as a teacher. I'm pretty animated, energetic, and fun. I've even been known to tap dance on a table to hold the kids' attention! I also made a point to include my maiden name on my nametag, since I chat with many teachers on facebook, and that's the name I use. Most people are visual, so even if they can't remember it, they'd recognize it! 5. 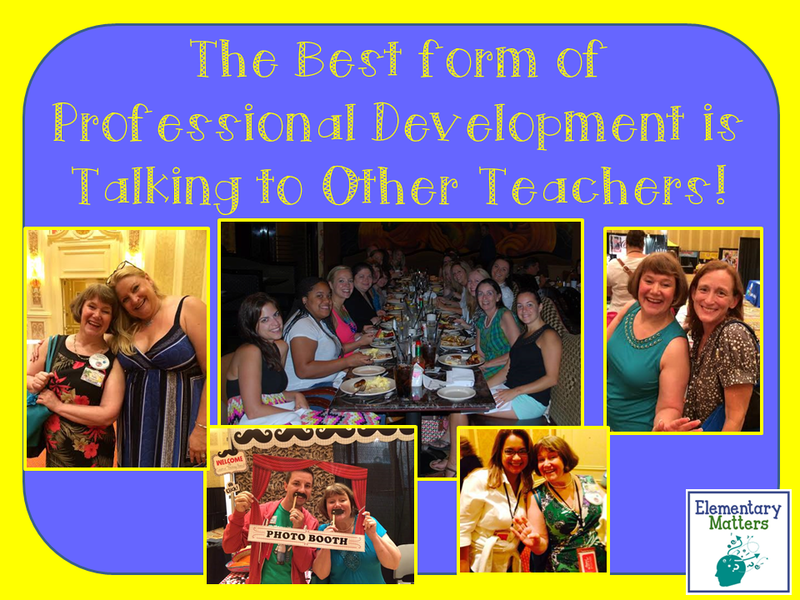 The Best Form of Professional Development is Talking to Other Teachers! I doubt there are any teachers who don't agree with this one! I went to 4 valuable sessions sponsored by Teachers Pay Teachers on Friday. I learned a lot from those sessions. I can honestly say I learned even more from the times I got together with other teachers. We had the blogger get together on Wednesday (which I met a lot of people, but actual conversations were tough because it was crowded and LOUD!) We had the Happy Hour on Friday, plus, many of us got together for meals and activities. We had some amazing conversations at these get togethers. Topics included our classrooms, Whole Brain Teaching, blogging, facebook, TpT ideas, Instagram, and even a few non-teaching ideas, such as weddings, divorces, our children, and the men in our lives! Honestly, those get togethers are the times I'll remember the most, and were the most valuable to me professionally. 6. 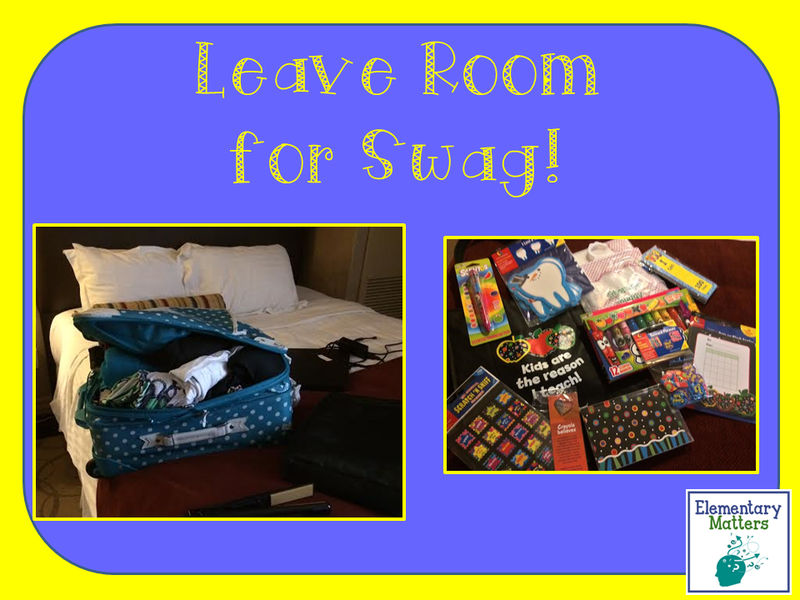 Leave Room for Swag! What you see in the above right picture is only part of what I brought home with me! Yes, I somehow managed to get that suitcase closed, but it was a real struggle! My roommate, Heather from HoJo's Teaching Adventures managed to have a good chuckle while I sat on my bag and struggled to zip it! 7. There's No Place Like Home! I've always felt the best part of any trip is coming home. 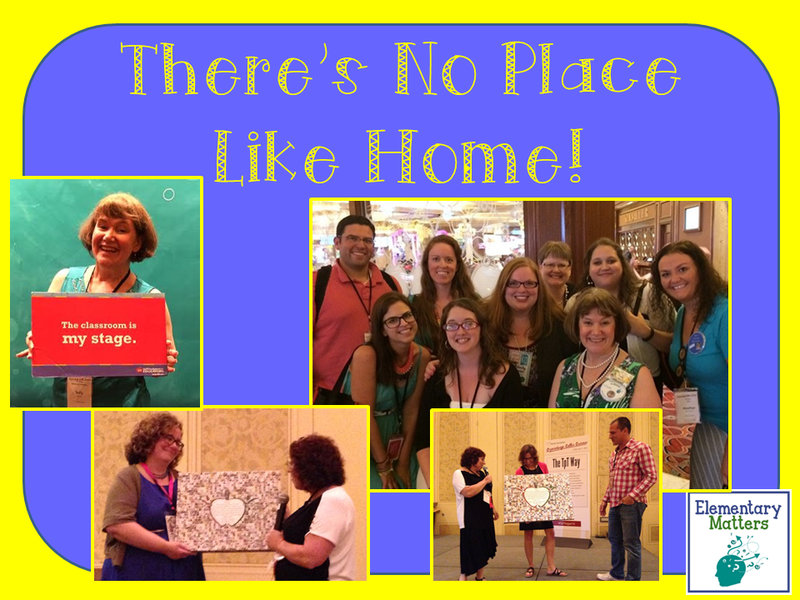 I had 4 fabulous days in Vegas with hundreds of AMAZING teachers, but it sure was good to be home! Even though it's all over, no one can ever take those memories away from me. One more piece of advice: if you're like me and find it impossible to sleep on a plane, don't take the "red eye". At some point I may get enough rest and start feeling human again, but I don't think that will be this week! Loved getting to chat with you and I'm looking forward to visiting with you again next year. I enjoyed it too! See you next year! 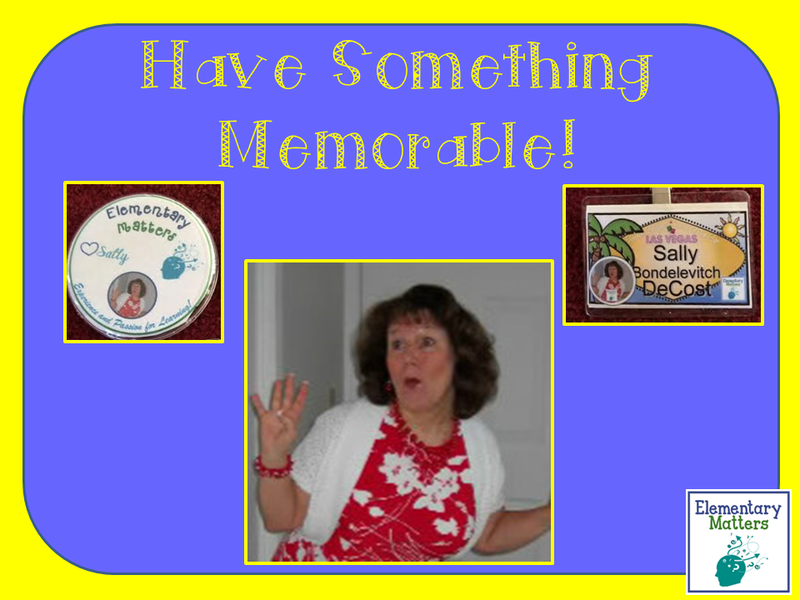 I loved hanging with you again Sally! I'm glad I got to spend time with you again this year! I'm already looking forward to next year! I'm not feeling bad at all! I was never much of a gambler... financially, that is! Great post Sally! Stay true to yourself! Sally, your logo is definitely an exception! It is so warm and inviting and fun and it always makes me smile. Glad you took the disclaimer at face value!! Loved catching up! So glad we got some pool time together. Heather and I looked at each other and chuckled when you mentioned the professional picture. We both have silly pictures, and, like you said, those pictures are working for us! I really enjoyed spending time with you again this week. I'm already looking forward to your presentation next year! Sally, loved your post, and I have always loved your logo! Don't know how I missed meeting you this year, but will definitely be looking for you next year! Thanks! I don't actually know how to fix the link!